When Henri Matisse dies, Chagall will be the only painter left who understands what color really is. From January 28th, 2017 to June 21st, 2017, the Montreal Museum of Fine Arts presented “Colour and Music,” a Marc Chagall retrospective. The largest Chagall exhibit in history, it showcased over 300 of his works of extensive mediums, including paintings, drawings, sculptures, costumes, set designs, illustrations and stained glass. The show focused on Chagall’s use of vibrant imagery to represent moments that held personal and cultural significance. As the show’s title suggests, color and music play an integral role in making Chagall’s scenes unique, fascinating, and resonant among viewers of various backgrounds and ideologies. The exhibit aimed to reunite highlights of Chagall’s expansive career and place his works under a new light. Young Marc was intrigued by art and drawing. This passion eventually led to his enrollment in various art schools. His work was exhibited for the first time at a show lasting from April 20th to May 9th of 1910. His displayed pieces - The Dead Man (1908) and another painting - were heavily criticized because they were unfamiliar, unlike anything anyone had seen before. In 1911, Chagall traveled to Paris for the first time to take more art classes and experience another country and culture. While in Paris, Chagall met many artists, writers, and art patrons, all of which inspired him in his artmaking. He began creating more works than ever before. At the start of World War I in 1914, Chagall traveled back home to Vitebsk. He stayed in Russia throughout the Revolution in 1917, after which he was encouraged to organize an exhibition for artists from Vitebsk. He moved to Moscow in 1920, leaving his home behind forever. In Moscow, he worked on various projects such as working with theaters to create set designs. When he returned to Paris, he became incredibly successful with increased popularity throughout the art world. In 1941, in the midst of World War II, the Museum of Modern Art in New York invited Chagall to stay in America, prompting his family to move to New York. In the latter half of his life, Chagall traveled and produced more small and large-scale works. As he got older, he explored a wider range of mediums, such as sculpture and stained glass. On March 28th, 1985, Chagall passed away in Saint-Paul-du-Vence, France at the ripe age of 97, capping off an over eighty-year career. The museum described the exhibit as “chronological and thematic” in nature. This setup allowed viewers to easily follow Chagall’s stylistic evolution, attributed to personal experience and changing geography. While much of Chagall’s art relies on variation of time and place, all of his works are unified by a deeply rooted sense of identity, particularly his Jewish upbringing. 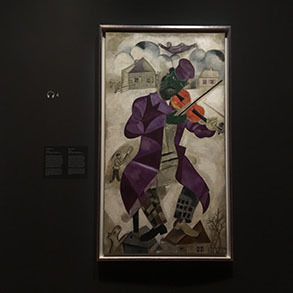 The Montreal Museum of Fine Arts asserted the paramount nature of Chagall’s Jewish identity in relation to music by playing Klezmer music throughout the exhibit. Klezmer music is a popular Eastern European Jewish genre of music, primarily played for celebrations. The use of music helped engage the public and make Chagall’s work more interactive. While listening, one felt as if they had been transported to the Eastern European village where Chagall spent his early years. The exhibit focused on multiple facets of Chagall’s art making, underlining his diversity of medium and subject matter. The Green Violinist (1923-24) is a later rendering of Chagall’s 1920 work Music, which was one of eight paintings commissioned by the Moscow State Jewish Theater (Introduction to the Jewish Theater, Dance, Drama, Literature, The Banquet, and Love on the Stage being the others). The painting is large, measuring 78 x 42 3/4 inches (198 x 108.6 cm), towering over any viewer. The man at the center of the image has a dark green face and right hand, complimented by a long, vibrant purple garment. The figure is standing on two roofs playing the violin. The subject of Chagall’s painting can be identified as a Klezmer musician playing the fiddle. The transient Klezmer musicians typically played the violin because it was easily transportable due to its size. Klezmer musicians traveled from village to village, spreading this traditional music. The widespread impact of Klezmer music asserts its cultural importance to Jews and within shtetls. Through the figure, Chagall pays homage to the music of his childhood, an integral aspect of his early life in Vitebsk. A common theme in his works, Chagall utilizes outlandish colors to highlight the sentiment tied to his images, whether it be whimsy or despair. This holds especially true in The Green Violinist, where the energetic green and purple donning the figure’s garments and skin point to the personal significance Chagall places on Klezmer music and musicians. By juxtaposing the green and purple figure with a primarily white, beige and black backdrop, Chagall establishes the fiddler’s purpose: to both literally and figuratively add color to an otherwise dull village. The Praying Jew (1914) is another Chagall composition tied to his native Vitebsk. The painting features an elderly man wearing traditional Jewish prayer garb: a tallis (a shawl worn by Jews during prayer) and tefillin (two small leather boxes, containing Hebrew texts of the Bible written on parchment). Chagall disclosed that his model was a beggar he had sit for the painting, dressing him in his father’s prayer attire. Using his father’s clothing, Chagall succeeds in personalizing the image, contributing to its emotional impact. The Praying Jew’s naturalistic depiction separates it from his more imaginative works, like The Green Violinist, highlighting Chagall’s stylistic variance. The figure’s rational face is contrasted by an unintelligible background. Chagall makes the background fairly simplistic, painting it with only black, white, and gray. The black and white are separated curved lines on the left and a straight line on the right, creating shapes. Paired with the black and white design of the tallis, the background adds a geometric element to the work. During the painting’s completion, many modernist movements, like the highly geometric Cubism, were in their early stages. By adding geometry to his work, Chagall showcases his awareness of the art world, gaining his main exposure during his travels to Paris in the early 1910s. In this work, he combines traditional elements of his past with new, exciting ideas and creative thoughts he was just beginning to explore. 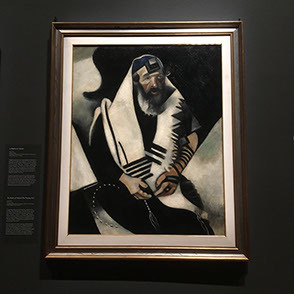 The Praying Jew carries a more somber and serious connotation than Chagall’s fanciful scenes, supported by the canvas’ subdued hues and the figure’s facial expression. When Chagall painted this piece in 1914, he had just come back to Vitebsk after spending a few years in Paris. Chagall paints with an awareness of time; as he gets older, Vitebsk gets older too, straying further away from the reality he once knew. As a result, The Praying Jew serves as a method for Chagall to preserve tradition and laments his childhood and the home he left behind. Aside from Jewish identity and Vitebsk, love is the major theme of Chagall’s work. For decades, Chagall’s most prominent muse was Bella Rosenfeld Chagall, his wife. His tender relationship with his wife is represented in many of his works. A turning point in his life and artwork was her tragic death in 1944. Chagall’s work takes on a more somber, symbolic attitude during this time period. His grieving is exemplified through the painting Grandfather Clock with Blue Wing (1949). Five years after Bella’s passing, the anguish of heartbreak was still apparent. The work depicts a grandfather clock prominently placed in the center with a blue wing on the right side. On the left half of the clock is a couple, presumably Chagall and Bella, embracing. The scene is backed by a nighttime village setting, a rooster donning the top left corner of the sky. Flowers adorn the bottom right corner of the painting, alluding to his use of flowers in previous paintings of him and Bella (ex: The Birthday (1915)). Chagall’s clock symbolises the ephemerality of life, while the couple on the clock note the everlasting bond two people form when they fall in love- a bond that transcends death. While his time with his beloved was cut short, his love for her can never be broken, no matter how many years they spent apart. While Chagall is most commonly known for his paintings, “Colour and Music” also featured his extraordinary costume and set design for operas and ballets. The exhibit showcased four shows that Chagall designed for, dedicating a room to each show. The first room of costume and set design was for “Aleko,” a ballet by Russian composer Sergei Rachmaninoff. The following two rooms featured other ballets: Daphnis and Chloe by Maurice Ravel and The Firebird by Igor Stravinsky. The stretch of costume and set design was concluded by the opera The Magic Flute by Wolfgang Amadeus Mozart. For each production, Chagall’s costumes are incredibly imaginative, ranging from princesses to jesters to mythological creatures (like the Firebird), Chagall showcases an ability to create a variety of costume types. His princesses are dainty and delicate, while his monsters and mythological creatures are clunky behemoths. However, all of his costumes possess a child-like ingenuity, making even his scariest of costumes endearing. His fabrics are covered in patterns, using colors spanning from light pastels to loud hues. In addition to costumes, sketches of Chagall’s set designs were on display. To accompany the sketches, videos were played on monitors, showing Chagall’s sets and costumes in performance. Music from each show filled the room, making the viewer feel as if they were watching the show unfold before their eyes. The exhibit’s back-to-back setup of the costume rooms allowed viewers to recognize the similarities in Chagall’s theater work, despite being produced for performances with widely different stories. At the conclusion of the exhibition, viewers were met with smaller reproductions of Chagall’s largest project. In 1964, Chagall was commissioned by the Metropolitan Opera’s General Manager, Rudolf Bing, to paint large murals to be hung in Lincoln Center (where the Metropolitan Opera performs). The elderly Chagall created two large murals for the display, entitled The Triumph of Music and The Sources of Music. Measuring 30x36 feet each, the massive painting pair hang in full display in Lincoln Center to this day. The Sources of Music side presents floating figures on a white background, including a figure playing an instrument in the center of the canvas. The Triumph of Music presents a similar scene on a red background, containing animal-like figures playing instruments. Both showcase the vivacity and color that music adds to the world, making it more than appropriate for an esteemed performance space like the Metropolitan Opera House in Lincoln Center. The museum exhibited the canvas copies (they could not be removed or transported) in a way that represented their grandeur without actually having them there. By placing the display at the end, the works were truly shown as a culmination of both Chagall’s career and the music and art theme of the exhibit, showcasing how music and art beautifully work in tandem. “Colour and Music”, exhibited by Montreal Museum of Fine Arts, successfully highlighted an artist that frequently loses the spotlight to other modernists. Throughout his long career, Chagall filled a niche previously left unfilled in the history of art. His work represents his present and follows him in his travels while referencing the childhood that shaped him. As he traveled and experienced new people and cultures, he embraced unfamiliarity but never forgot his roots in Vitebsk. His art places Judaism in the forefront, and he is now one of the most recognizable and influential Jewish artists. Chagall’s works beautifully balance adventure and nostalgia, tackling deep personal events with hints of youthful whimsy. The exhibit left visitors feeling as if they understood Chagall, and how both color and music impacted his life and art.